Air pollution in the UK is an incredibly important topic. Whether you suffer from Asthma, have respiratory problems or nothing at all there will be moments where you or someone you know will be affected by the air around them. When I first moved to London in 2016 I was shocked to realise just how bad it was, just on my walk home I would experience pollution that often exceeded band 7, simply blowing my nose would reveal black soot lining the inside after a day in Zone 2 London. It's strange to see how little this subject is discussed publicly, perhaps due to the saturation of data regarding the current and historic levels of pollution making it harder for people to research. So to try and make it easier for people to digest the facts I created citybreathe.com. 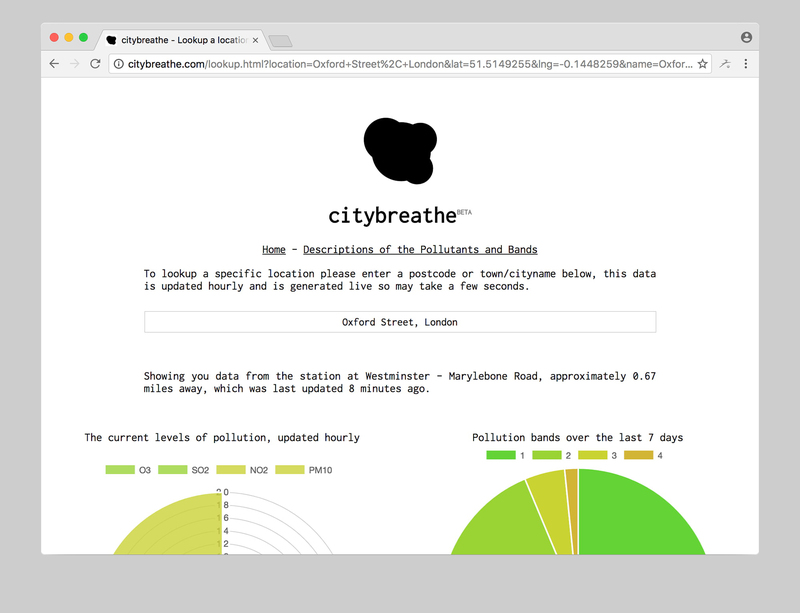 Citybreathe is a nonprofit website that allows anyone to track the pollution across London and the south/south east for free, easily viewing historic data and any trends that can be derived. It's possible thanks to the Environmental Research Group of Kings College London which provides the necessary pollution station data via their London Air Quality Network. My system routinely monitors the stations across the network hourly, storing this data to be further analysed later. As the project is in beta I will be making significant additions to the site, including more visualisations and the ability to mass export data. I'll also write up exactly how I manage to sort through such large collections of data on the small server setup I currently have. You can view this project on github.